The animals are having their AGM and after elephant has posed his big question they all have much to think about and answers to give. That is everyone except Ant who is too busy writing things down and bustling about. 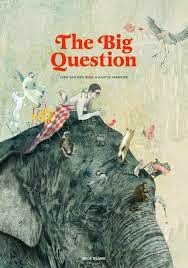 And elephant’s question? How do you know when you love someone? This is one of those rare but special books that will mean different things to many people and will be appreciated by a wide age range. Small children will spend many moments on each page identifying the images; older people will ponder on the meanings of the words. And everyone (except Ant) will go away to think further about the ideas that have been raised.